Okay, so this one's a little bit behind the times, having come out toward the end of September. But it's well worth writing about regardless. Bloc Party's Kele Okereke again finds himself guesting on a producer's track, following his excellent RAC collab. 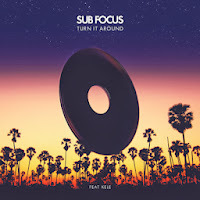 'Turn It Around' is another sparkling offering, with Sub Focus twiddling the knobs this time round. Much like Kele's own impressive recent collaborative history, Sub Focus has been combining well with other artists of late also. We particularly enjoyed the bombastic 'Tidal Wave', where he joined forces with Alpines. 'Turn It Around' has a bit of a Balearic thing going for it, with Kele's yearning vocal and lyrics layering the track in hope and desperation. It's a compelling mix. Find more info at subfocus.com.